It’s always exciting going to a new track for the first time, and Circuit of the Americas (COTA) was no exception. 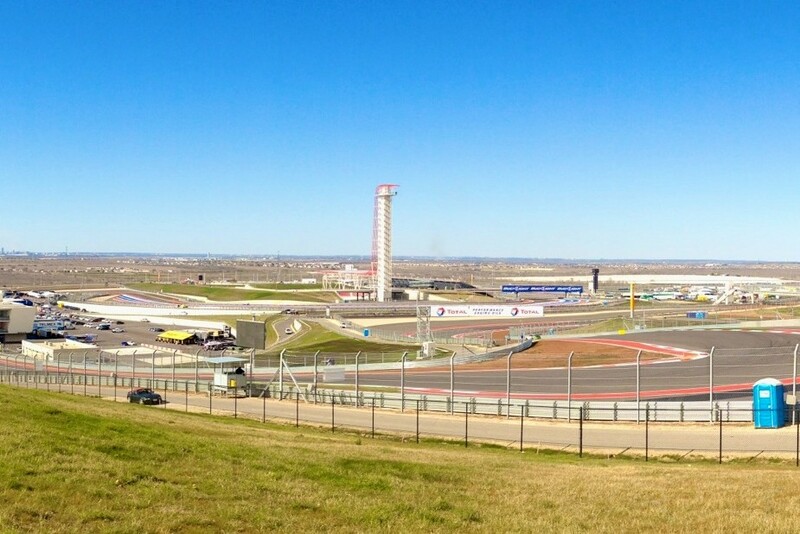 COTA is the newest and arguably nicest Formula 1 circuit in the world, and the facility certainly did not disappoint. Thursday was the Promoter’s Test day and the first order of business was having our drivers David Baum and Cory Friedman get familiar with the track configuration and the best way to execute it. The #24 Hastings Fiberglass / Mac Papers Porsche Boxster was good enough that we did little set up work the first day. After an evening to process what was learned the day before, on Friday we focused on making the car as fast as possible. Our pace was good on old tires, typically within a second of the fastest cars in class. 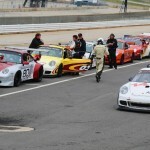 Practice, much like the test day, was plagued with black flags, so track time and set up opportunities were compromised. The final session of the day was qualifying, and David did a good job, qualifying about halfway up a very large and competitive ST field. We closed out Friday with race prep and pit stop practice. Everything was in good order when we arrived to race early Saturday morning. It was a good day for racing; the weather was perfect, clear, cool and dry. David took the green flag and had a strong opening stint. He maintained position and avoided multiple potential disasters, and just before the one-hour mark, he turned the car over to Cory in perfect condition. The stop was early, and we knew we needed time under caution to make it to the end, but all of the front-runners took the same gamble. From the drop of the green flag on the first restart, Cory began to move up positions. 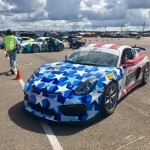 The Boxster proved to have excellent race pace. There are no easy passes in the top-15, but with tenacious battling and inspired racecraft, #24 moved firmly into the top-10 (see highlight video). The intense racing was interrupted by a pair of short cautions, and into the last hour Cory was fighting hard with the points-leading Honda and an unusually wide VW for a spot in the top-5. With under 10 minutes remaining, the race and weekend had gone nearly flawlessly, and a repeat of the 5th place finish we had at Daytona was looking very reasonable, though we were dangerously low on fuel. We had to hope that fuel economy during the cautions was better than expected or for a late-race caution. Regrettably, neither came to be, and fuel ran out with 2 laps remaining. None of the other 15 cars that were on the same fuel strategy as us had this problem, exposing a huge lack of parity in the class. This is a problem we’ve known about since last season and requested a change in the regulations multiple times. We can only hope that with this undeniable evidence, our next request will not be denied. Despite the disappointing conclusion, it was a fun, exciting and highly competitive weekend. 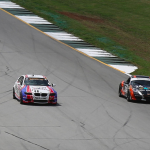 David will be joining us again for the CTSCC event at Road Atlanta next month, where we’ll look for another top-5, or with a bit of luck, a spot on the podium.